Click image to enlarge Mount Hood, Oregon, as seen from Larch Mountain, Oregon. Image taken August 3, 2008. This website author has never seen any of these lookouts and currently has no other information on them. This list is presented for information only and it remains to be seen how it will be incorporated into the "ColumbiaRiverImages.com" website. All of the following information was obtained on "firelookout.com" website, 2014. Washington Division of Forestry/Mount Hood National Forest, elevation 1,141, USGS Benchmark RC2410, USGS Benchmark RC2411, Geocache. In 1930: a 15-foot wooden live-in. In 1942: a 10-foot wooden L-4 tower. In 1946: a cabin. Destroyed in 1967. Station is on top of peak. Washington Division of Forestry, elevation 730, USGS Benchmark RD2117, a camp in the 1930s, abandoned in the 1950s. Note: Benchmark RD2117 is not on Beacon Rock but on another butte, monumented in 1901, described at "on brush-covered rounded hill, on a shoulder overlooking the river and Mr. Graaffs residence, directly back of Butlers Landing. ", N45°37.566, W122°02.935 (NAD 83). Oregon Department of Forestry, elevation 1,573 feet, USGS Benchmark RD2413, USGS Benchmark RD2414. In 1934: a crows nest and camp. Abandoned in the 1940s. Gifford Pinchot National Forest, elevation 2,480 feet, USGS Benchmark RC2317, USGS RC2328, Geocache. Developed with a gable-roofed L-4 cab with windows on only three sides in 1931, an L-4 cab replaced it in 1953. Both were located 1/4 mile south of the summit. 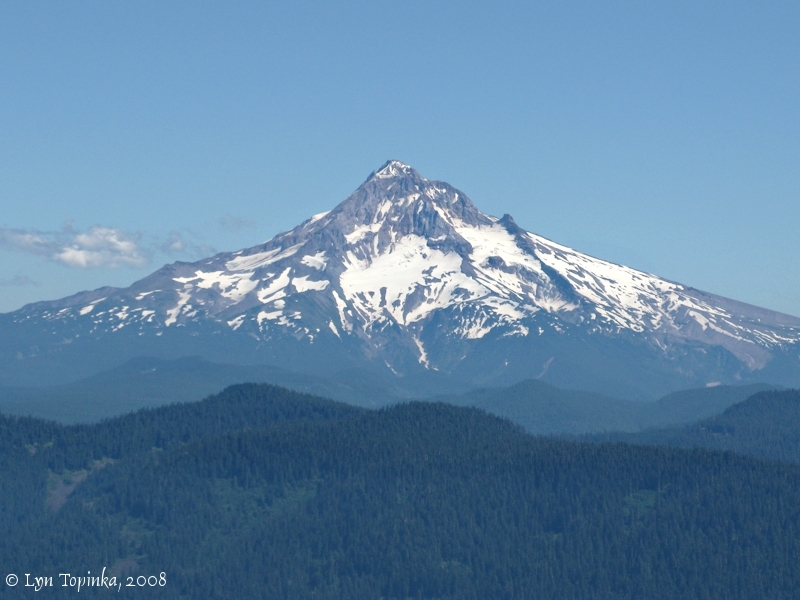 In later years it was staffed by the Mount Hood National Forest for its excellent vantagepoint across the Columbia River. It was destroyed in 1967. Washington Division of Forestry/Department of Natural Resources, elevation 3,422, USGS Benchmark RC2431, USGS Benchmark RC2460, USGS Benchmark RC2461, Geocache. In 1938: a 10-foot wooden live-in which was destroyed in 1961. Mount Hood National Forest, elevation 4,058 feet, USGS Benchmark RD2153, Geocache. Lookout was established in 1914 with a platform and cab atop two 90-foot fir trees. In 1923 it was replaced by a 90-foot steel tower and a ground house. In the 1940s a 100-foot treated timber L-4 tower was built with a tourist observation deck below the cab. The structure was removed in 1976. Washington Department of Natural Resources, elevation 3,473 feet, a 40-foot wooden tower with L-4 cab, built in 1952 and destroyed in 1974. Gifford Pinchot (Columbia) National Forest, elevation 12,276, USGS Benchmark SB1004, Geocache. The Mount Adams Lookout was the highest lookout in Washington State. Construction began on the D-6 cupola cabin in 1918 and continued for 3 years. The lookout was staffed between 1922-1924 and then abandoned. SUlfur miners took over the cabin in the 1930s, adding a couple of additions and recycling the cupola in the process. The cabin is still there, encased in ice most of the time. Mount Hood National Forest, elevation 11,245 feet, USGS Benchmark RC2241, USGS Benchmark RC2242, USGS Benchmark RC2244. Lookout was first established in 1915 with a firefinder and tent. This was quickly replaced by a Lige Coleman prototype for the D-6 cupola cabin. Abandoned in 1935. Cabin slipped off the summit in 1941. Gifford Pinchot National Forest, elevation 9,677. Construction began on the cupola cabin in 1918, with work continuing until 1921 due to the unpredictable weather on the summit. The lookout was abandoned about 1929. Nothing was left of the building by 1980 except the foundation. All remains were destroyed in the volcanic eruption of May 18, 1980. Mount Hood National Forest, elevation 3,872 feet, Geocache. In 1929: tent cabin. In 1930s: L-4 cab. Gone by 1963. Oregon Department of Forestry, elevation 2,137 feet, Geocache. In 1937: a 10-foot wooden L-4 tower which was abandoned in 1955. Structure is now gone.